KA�lle Alaaf! That is how you might be greeted in Cologne where today, on the 11th November at 11.11 am, the official Karneval season begins. Karneval, also known as the fifth season, is a tradition that goes back to the middle ages. Although it has changed a lot over the years, the KA�lner Karneval as we know it nowadays is one of the biggest celebrations worldwide. 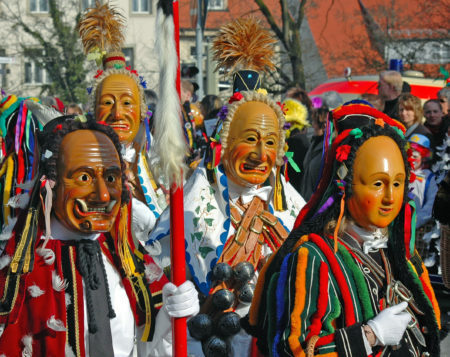 On the 11.11. at 11.11 am the celebrations begin on the Old Market in Cologne with concerts of the most popular carnival bands like Brings, BlA�ck FA�A�ss and De HA�hner. From November onwards there are many Sitzungen (stage shows) with music, dancing and stand-up comedy. It is an unspoken obligation to dress up when you attend a stage show or go to one of the parades which start on Weiberfastnacht (Fat Thursday). The highlight of Karneval is the big street parade on Rosenmontag (Rose Monday) which is the biggest and one of the oldest parades in Germany. Hundreds of thousands of people from all over the world come to see the 8km long parade consisting of colourful floats and street groups. If Karneval inspires you to visit Germany and pick up some useful German, Cactus Language has German language courses in Berlin, Munich, Hamburg, Cologne and a number of other German cities. To find out more information simply call us on 01273 830 960 or email us. Our multilingual team will be happy to answer any questions you may have. Next Next post: November is Spanish Month!